When we hurt our elbow, we seek the help of an X-ray scan to check whether there is any bone fracture. The X-ray scan helps us to examine parts of our body that we cannot visualize from the outside. However, when it comes to the nanometer scale, which is 1000 smaller than a single hair, the X-ray based approach is insufficient to view the inside of a material because the method requires a high enough concentration of molecules for detection. In order for us to have a better understanding of microscopic matter, a technique to study nanoscale properties efficiently and accurately is essential for scientific breakthroughs. Semiconductor nanowires (NWs) can build small electronic products and improve the performance of modern technology. Because of the increased surface area compared to a wafer-based device, the use of nanowires enhances the capability of chemical reactions and sensing applications. The one-dimensional silicon nanowires (SiNWs) based nanodevices – from solar panels, light-emitting diodes (LEDs), and biological sensors – can create new routes for semiconductor utilization. For a better conductive performance, SiNWs are commonly doped— a process in which extrinsic elements such as phosphorus are introduced into the crystalline lattice. As the free electrons from phosphorus favor the flow of electricity, the electrical conductivity increases. It is analogous to the strength reinforcement by adding rebar to the concrete. However, it is still challenging to precisely monitor the dopants at the nanometer scale and to manipulate the electronic properties. Researchers at the University of North Carolina at Chapel Hill demonstrated the use of infrared (IR) nanospectroscopy to measure the amount of charge carriers introduced from the dopants. By measuring carrier concentration, the variation in conductivity can indicate how many dopants are in the NWs. IR nanospectroscopy is based on atomic force microscopy (AFM). By focusing the IR light on the tip of the AFM probe, we can measure the free carrier behaviors in the NWs. The variation of the responses reveals changes in the SiNWs based on regions of doping (Figure 1). Figure 1. Schematic diagram of IR nanospectroscopy. 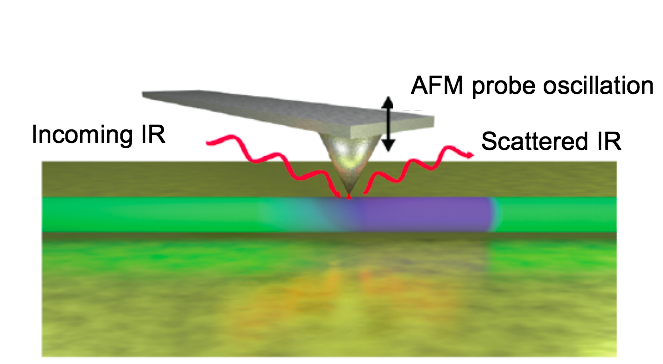 The purple and green color-coded nanowire under an AFM probe indicates whether the dopants presented. IR nanospectroscopy detects the scattered IR light and simultaneously records the surface topography. 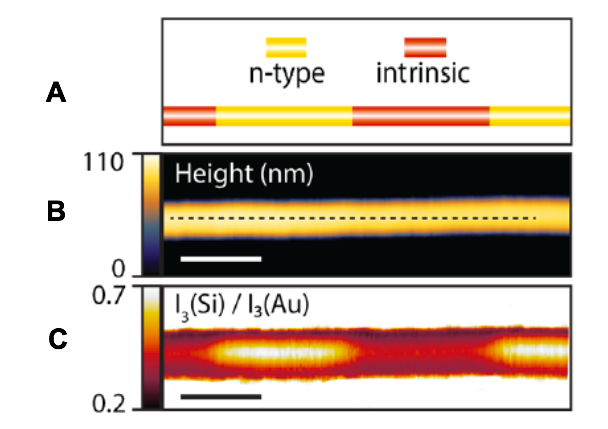 With IR nanospectroscopy, the doping regions of the SiNW show up as bright sections (Figure 2C). The authors used a CO2 laser to visualize the charge carriers contributed by dopants in the SiNWs. 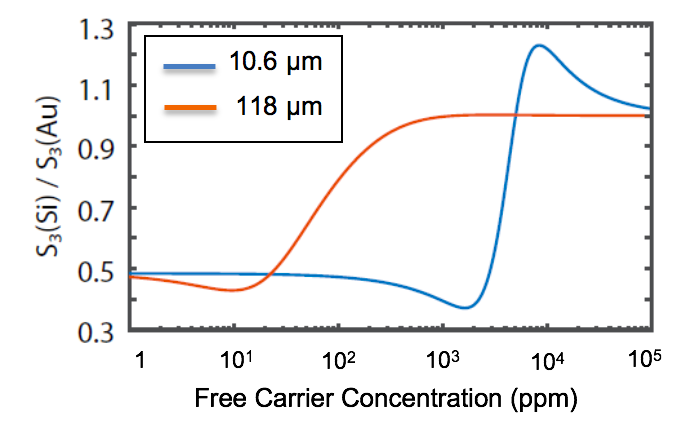 Because free carriers absorb IR, a stronger signal appears in the doping region. Without the boost from the IR illumination, we are not able to tell the difference between the doped and undoped regions (Figure 2B). Figure 2. Images acquired by IR-nanospectrscopy of SiNW. A: schematic of the designed doping profile. The yellow sections represent phosphorus dopants (n-type doping) infused to the silicon crystal. B: AFM surface topography. C: IR nanospectrscopic response of the same SiNW in B. Scale bars: 400 nm. The method has a high sensitivity – the ability to detect the target substances at a low concentration. With IR nanospectroscopy, the authors can achieve a sensitivity of 1000 times more than conventional methods. The sensitivity range lies in 103 to 105 ppm when using CO2 IR illumination with a wavelength of 10.6 μm (Figure 3). With a longer wavelength (118 μm), the sensitivity can be further improved to 1 ppm. This is like locating a single word from all seven Harry Potter novels! Figure 3. IR nanospectroscopy signal dependence on probing frequency. The technique is sensitive in 103 to 105 ppm when probed with IR light at a wavelength of 10.6 μm. 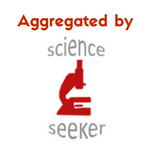 When a longer wavelength at 118 μm is used, only 1 to 100 ppm of analyte is needed for detection. IR nanospectroscopy can characterize a variety of materials used in science and industry. In fact, the technique has been realized commercially in recent years. We are looking forward to more efficient nanostructured devices brought about by the advancement in IR nanospectroscopy. *All figures are reprinted (adapted) with permission from Nano Lett. 2017, 17, 11, 6591-6597. Copyright 2017 American Chemical Society.